Super Hero Boy: DVD Review : Hit Entertainment 4 DVD Action Pack! DVD Review : Hit Entertainment 4 DVD Action Pack! One package, four seperately dvds in one fat chunky case. You know what that means mommas... the perfect travel companion and an all in one entertainment center. heh. Sorry I couldn't resist. Actually we love collections like this for just that reason they are easy to transport and even easier to store. 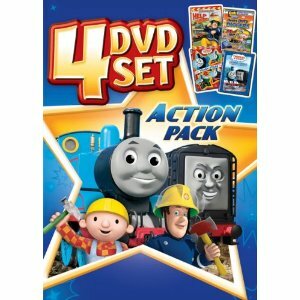 Hit Entertainment's new 4 DVD Action Pack includes two of the favorites for boys both Thomas & Friends and Bob The Builder with a Fireman Sam dvd thrown in for good measure. All four dvds are full length Hit Entertainment features all feature several episodes each as well as bonus features. Thomas & Friends : Steamies vs. Diesels - This is an older dvd and is not CGI though to be perfectly honest I'm a big non CGI Thomas fan though the animation is not as smooth there is something about the old style Thomas that I really enjoy. Thomas & Friends : Track Stars - a newer dvd and not one we had previously seen. We especially love the sing along extra on this dvd as well as the read along. Bob The Builder : Heavy Duty Diggers - I was really suprised to see this dvd included as its fairly new and we even did a full review for it when it was released singally. It inlcudes five Bob episodes and is still one of Connor's favorites. Fireman Sam : Help is here - Fireman Sam is one of my favorite Hit Entertainment characters. I guess we are partial around here as my husband is in public service as well. I also love the fact that Fireman Sam gives kids a role model for safety and helping others, something Connor desperately needs. All in all you end up with 182 minutes of run time which is more than enough to make it through most car trips! I especially love that all the dvds are included in one thicker than average case that keeps them organized and it's easy to grab on the way out the door or to throw in an overnight bag for the grandparents. You can pick up your own copy of Hit Entertainment 4 DVD Action Pack on Amazon right now! Disclosure: We were given a copy of Hit Entertainment 4 DVD Action Pack free of charge, we were not compensated for this post in any other way. My opinions and comments on items we review are always my own and are never influenced by sponsors.